A partial solar eclipse — one of only two on Earth this year — was visible in the sky over much of the eastern USA early Sunday morning. It was the second solar eclipse this year, according to NASA. The eclipse, seen for only about 30 minutes after sunrise, appeared throughout the entire East Coast where clouds didn't obscure it. It could only be seen as far west as eastern Ohio, eastern Kentucky, eastern Tennessee and most of Georgia. But unlike May's annular eclipse, where the moon stands directly in front of the sun but still leaves a visible ring of light, Sunday's eclipse was another breed entirely: a HYBRID ECLIPSE. WHAT IS A HYBRID ECLIPSE: A hybrid between an annular eclipse and a total eclipse, where the moon is just large enough to completely block out the sun, leaving behind a hazy corona visible. Due to the curvature of Earth, different regions along the hybrid eclipse's path will see it as either total or annular. Hybrid eclipses are rarer than other types, accounting for a little under one out of twenty of all solar eclipses. The last hybrid eclipse occurred in April 2005, and the next one is expected in 2023. 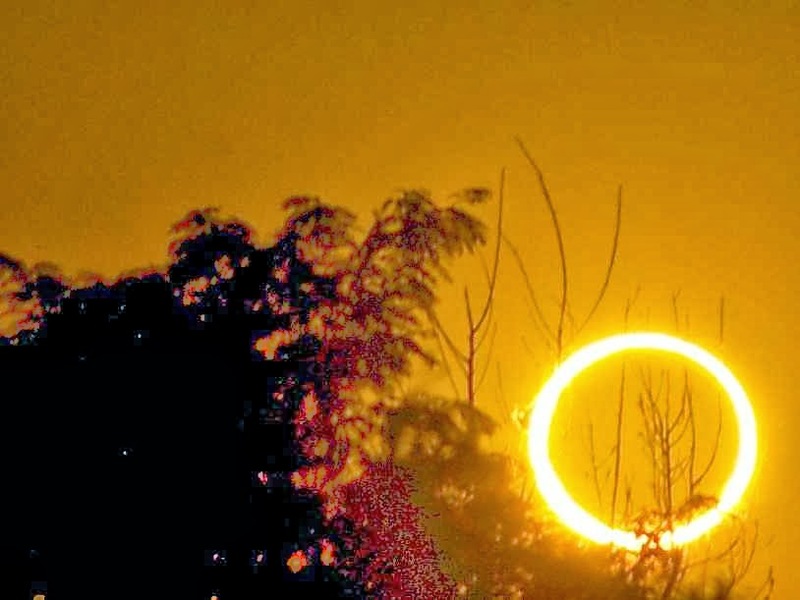 This eclipse was a rare "hybrid" eclipse, in which a few parts of the Earth saw an "annular" eclipse (where the moon does not completely block out the sun, leaving just a "ring of fire" around the moon), while other parts saw a "total" eclipse, when the moon completely covers the sun. 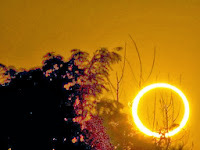 The USA, along with parts of Europe and Africa, didn't see the annular or the total variety and were treated instead to a "partial" solar eclipse: The sun appeared as if it has had a big bite taken out of it. Only people in central Africa, in countries such as Gabon, Congo, Uganda, Kenya, Ethiopia and Somalia, saw the total eclipse of the sun.Unlike total, annular, or hybrid eclipses, partial eclipses block a smaller fraction of the sun. A partial eclipse may not be the once-in-a-decade occurrence as is a hybrid eclipse, but it's still a welcome way to start out a Sunday morning. Weather conditions were forecast to be best for eclipse viewing in the southeastern U.S., where clear skies were expected Sunday morning, according to AccuWeather. Skies were predicted to be cloudier in the Mid-Atlantic and along the Northeast coast, while rain and even some snow showers may have obstructed the sky in interior sections of the Northeast and New England. The next chance to see a total solar eclipse in the U.S. will be Aug. 21, 2017.